performed by Henry Cavendish in 1798. According to Newton’s law of gravity, every object in the universe attracts every other object, with a gravitational force proportional to the product of their masses and inversely proportional to the square of the distance between them. This equation is one of the most famous in physics, almost as famous as Einstein’s equation relating energy and mass. F is the force between two masses, m1 and m2. The distance between the centers of the two masses is r, and G is Newton’s gravitational constant. Newton’s constant can’t be deduced purely from math. In order to calculate G, the gravitational force between two known masses at some known distance must be measured. Ironically, Newton never knew the value for his own constant. Because gravity is so weak, G was too small to measure until the end of the 18th century. In 1798, the British scientist Henry Cavendish was able to work out the value of this constant in an experiment designed to determine the mass of the Earth. He used a torsion balance: two lead balls attached to the ends of a light, wooden rod suspended by a thin wire. 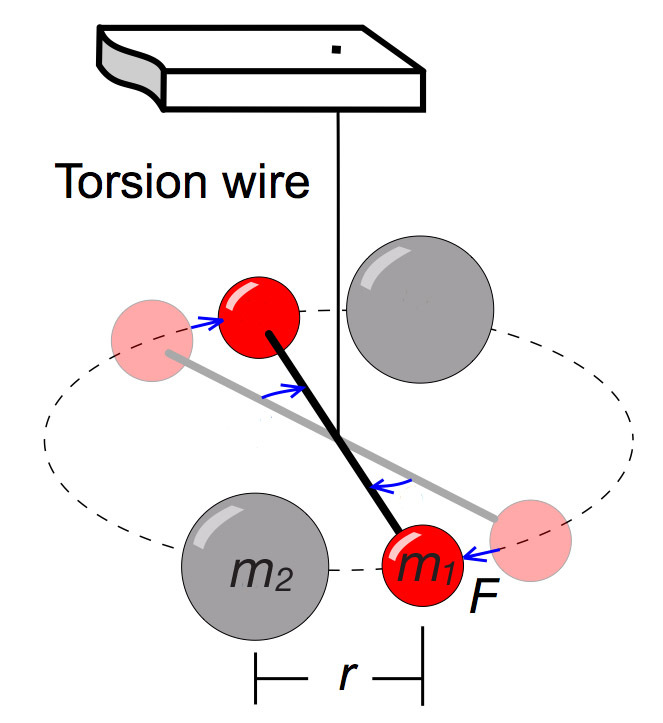 He then brought two larger lead balls next to the smaller ones, so that they would exert a gravitational force and twist the rod a small amount. Cavendish’s experiment was remarkably sensitive for its time. The twisting force exerted in his experiment was roughly equivalent to the weight of a grain of sand. Cavendish was careful to prevent wind and temperature changes from interfering by placing the whole apparatus in wooden box enclosed in a shed. He used a telescope to observe the motion of the rod, which was only 4.1 mm. By using a vernier scale he was able to achieve an accuracy on the order of one hundredth of an inch. It would be nearly a century before someone would produce a more accurate result. In metric units, G is the gravitational force between two one-kilogram masses separated by one meter, about 6.7 x 10-11 newtons. That is a very small force, considering a newton is about one fifth of a pound. For example, consider how massive an object would have to be in order to exert one newton of force on a one hundred kilogram man at a distance of 10 meters. If you do the math, you will find that the mass, m1 = (F x r2) / (G x m2) = 6.7 billion kilograms, about the same as the mass of the Great Pyramid of Giza. So even if you had an 10-meter-radius sphere made of solid lead, it would not exert a full newton of gravitational force even if you lying on top of it (assuming you don’t weigh more than 100 kg). It should be noted, of course, that although Newton’s law of gravity is sufficiently accurate for most practical purposes, Einstein’s theory of general relativity must be employed when the objects being studied are moving at relativistic speeds or if their masses are large and close together. That is why there is a slight discrepancy in the orbit of Mercury when comparing its observed motion with its predicted motion using Newtonian calculations.